Tired of serving the same old boring meatball appetizers at every party? 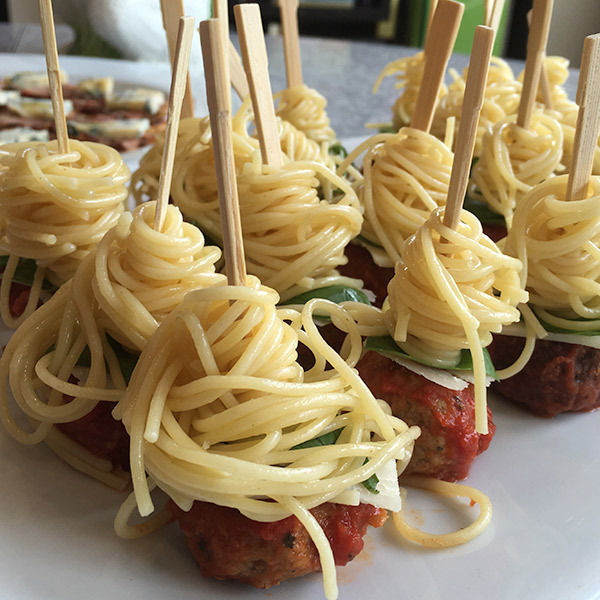 Mix things up and give our Spaghetti and Meatballs on a Stick a whirl! In this easy recipe, Shannon swirls strands of spaghetti onto meatball skewers to create fun and finger-friendly party appetizers that your guests are sure to love. Simple, saucy and oh-so good! Cook pasta to al dente according to package directions. Spray drained pasta with nonstick cooking spray or toss with olive oil. Set aside. Warm meatballs in the sauce on the stovetop. Transfer meatballs to a serving platter. Working with 3 strands or so, twirl pasta around a skewer. Add a torn basil leaf and square of Parmesan to the skewer, and then stick into a sauced meatball. * Or use your own homemade spaghetti sauce or meatball recipe—even better!